Dmytro Tzenov briefed protesters about the investigation progress. 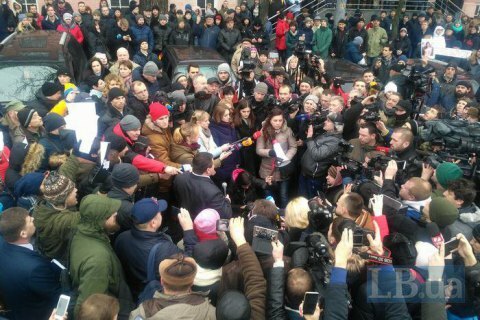 On Tuesday, 2 January, around two hundred protesters gathered in front of Kyiv police headquarters demanding a speediest probe into the death of the lawyer Iryna Nozdrovska, a correspondent of LB.ua reported. A high-ranking police official, Dmytro Tsenov, came out to tell protesters that the police had already questioned 50 people and scrutinised the records from CCTV cameras. "Yes, unfortunately, yesterday we found Iryna's body. Today, after the crime scene investigation her body was taken for forensic examination to determine the nature of injuries, the cause of death and a number of operational measures," said the policeman. In the course of the rally, one protester hit Tsenov, a brawl ensued but the situation soon calmed down. Nozdrovska, was a defence lawyer in the death of her sister Svitlana Sapatynska, who was killed in a road accident on 30 September. Nozdrovska said that the culprit, Dmytro Rossoshanskyy was under the influence of drugs during the incident. His uncle at that time served as chairman of the Vyshgorod District Court and helped the killer escape punishment. In May 2017, Rossoshansky was sentenced to seven years in jail. The court took into account that the driver saw the pedestrian, but did not brake or tried to avoid a collision. In addition, instead of calling an ambulance, he phoned his father for advice. Rossoshanskyy's defence filed an appeal. In the hearings on 27 December his lawyer tried to used the violations committed by the first instance court, but the appellate sent the case for a new trial. Iryna Nozdrovska disappeared on the next day after the appeal trial.